Communication junior Scott Wolf eats truffle fries from Edzo's Burger Shop in downtown Evanston during Sunday's Big Bite Night. This year, over 30 different restaurants participated in the annual event. 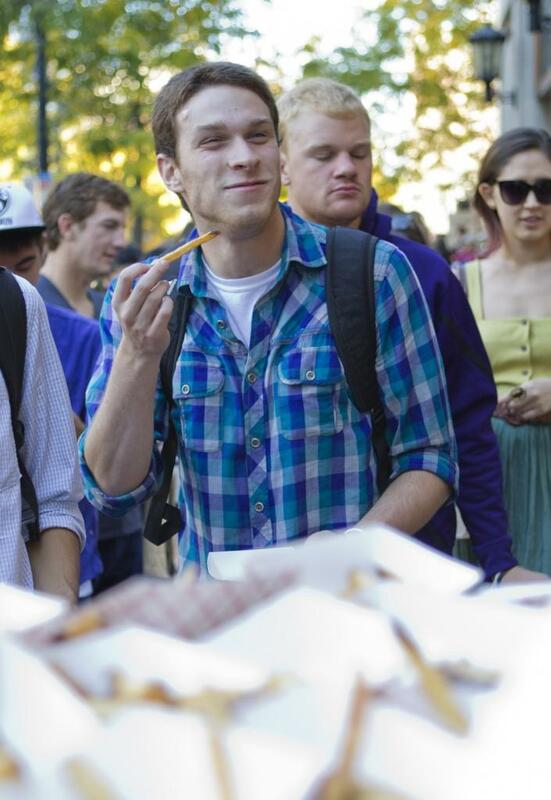 Northwestern students piled up in line next to Andy’s Frozen Custard to enjoy hand-scooped vanilla custard cones at Sunday’s Big Bite Night. The annual food festival in Evanston officially featured 33 local restaurants, including Clarke’s Diner, 720 Clark St., and Creperie Saint Germain, 1512 Sherman Ave. Downtown Evanston and NU’s Associated Student Government organized the event. Kevin Newman, manager of Evanston’s Pret A Manger, 1701 Sherman Ave., said this year was the first time his restaurant participated in Big Bite Night. Pret A Manger offered students bags of sample products, including free soup and coffee vouchers, chips and a drink. “Anytime we have a chance to kind of do a promotional giveaway with the community, we always go big,” Newman said. Allison Toth, assistant manager of Andy’s Frozen Custard, 719 Church St., said she offered free eats to students at last year’s Big Bite Night as well. Toth recalled that Andy’s gave out carrot cake last year and said the vanilla cones were a good change. “(The carrot cake) was just a lot more time consuming instead of just dipping some sample cones,” she said. In addition to offering free food throughout Evanston, Big Bite Night provided students coupons for future use, such as a free drink with one purchase at Soulwich, 1634 Orrington Ave., and 15 percent off one order at The Olive Mountain, 610 Davis St.
Steven Monacelli, ASG community relations vice president, said ASG tried to post more signs this year to help students find restaurants. But Big Bite Night organizers may prepare set routes throughout Evanston next year to make locating venues even easier, the Communication senior and former Daily staffer said. Weinberg junior Divya Venkat said she attends Big Bite Night every year. This year, she visited various vendors, including Whole Foods Market, The Olive Mountain and Pret A Manger. Still, Venkat said she had some problems with the food. But for Weinberg sophomore Anna Rennich, Big Bite Night provided a nice break from school as well as free food. “It’s better than doing homework,” Rennich said.